It has been tested and proven that you will get the biggest response from renters after they have received the 3rd mailing piece. That’s why we have created a 2 separate series of 3 postcards for you to mail. 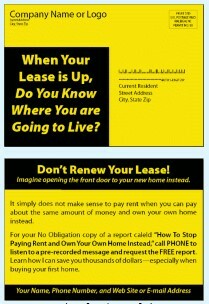 It has been tested and proven that you will get the biggest response from renters after they have received the 3rd mailing piece. That’s why we have created 2 series of 3 postcards for you to mail. Simply add your contact info, logo, NMLS info and download/print. Here’s what you get for only $99. Did you know that for as little as your 1st month’s rent and security deposit, that you have enough money to buy a home? Should you buy a home now? Or Wait? Sample of only 1 of the 6 postcards included in Basic Kit. The Basic Kit contents are emailed to you at the address you provide upon checkout. You will receive an order confirmation that contains the links to download the materials for the Basic Kit. If you haven’t received your order confirmation containing the links within 24 hours, please check your bulk email folder. Call 800-535-3343 (Ext. 1) with any questions. Apartment Complex Lists Not Included — Click here to order a list of addresses. Order 6 postcard samples, Renter’s Free Report, Sample Script, Monthly Marketing Calendar and Free Coaching Session for $99.